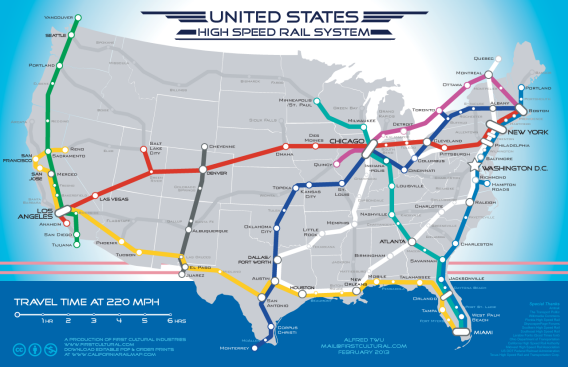 U.S. high-speed rail map: Artist Alfred Twu's alternate reality. In the real world, President Obama’s grand plans for a national high-speed rail system sputtered out in the face of Republican opposition. But in the alternate world depicted by graphic artist Alfred Twu, we’ve realized them all, and more. The map above depicts Twu’s vision of an America whose major cities are all connected by state-of-the-art, 220 mph trains. His map isn’t strictly based on the Obama administration’s actual plans, shown here. It’s far more ambitious than that. In short, it’s a mass-transit lover’s wildest dream. New York to Boston in an hour flat. New York to Los Angeles in a single day. Connections to Vancouver, Toronto, and Monterrey. More recently, in the fall of 2012, I led a Kickstarter-funded project with a dozen friends to create the California Rail Map, which shows train and bus routes in California. There was a decent amount of sales and coverage for the map, and as we pondered what region to do next, I realized we needed fans outside of California to get a similar map funded for the Northeast. So I dug up the old files for the national high speed rail map, added cities and a time scale. The response has been far above and beyond my wildest expectations as I think it may have touched a raw nerve in the national psyche as four years layer, most of the planned projects from 2009 have fizzled out and California is still a few months away from groundbreaking. Twu, a committed high-speed rail advocate as well as a graphic designer, has followed up with a WhiteHouse.gov petition to fund a network that looks like the one in his map. The irony, of course, is that the White House already tried to fund a national high-speed rail system, using stimulus money to get things under way. But Republican governors in Florida, Wisconsin, and Ohio refused to accept the money, and Congress scuttled additional funding.